Former P*rn star and social media personality who is better known for her brief stint in adult industry from 2014 to 2015. This overnight sensation was ranked #1 on the adult website P*rnhub in December 2014. She was one of the favorite adult stars of her generation and was the most searched adult actress in 2016. Mia Khalifa was born on 10 February 1993, in Beirut, Lebanon. She’s currently 26 years old. Mia holds a Bachelor of Arts degree in History from Univthe ersity of Texas at El Paso. She married an American in February 2011. There are no further information available about her husband at this time. 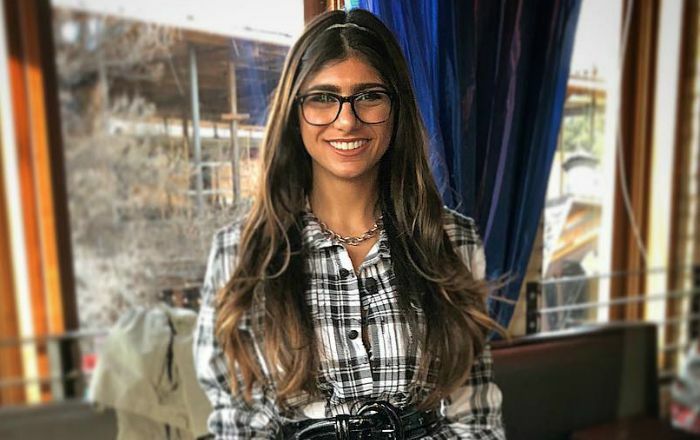 Mia Khalifa first appeared in a video titled Xtra 15 as herself in which she was credited as Mia Callista. Mia was not cast in feature films yet. She did not appear in any TV shows as of now. Having a successful career as an adult movie actress and her most popular adult movies and videos. Mia has an estimated net worth of $2 million which she earned from her short lived career as a p*rnographic actress. She worked at an American-based fast food chain, Whataburger before landing a career in adult industry. She took p*rnography after she was approached by a customer who asked if she had ever considered appearing in pornographic films. Born in Lebanon, she moved to the United States in 2000 when she was seven years old. She was raised Catholic but now she doesn’t practice it. As a teen, she lived in Montgomery County, Maryland and played lacrosse in high school. She began to appear in adult videos in October 2014 and at the peak of her career, she was ranked at #1 on several adult steaming websites. Just like the popularity of the actress skyrocketed overnight, she faced lots of criticism from the Middle East and even death threats. That reactions came when she appeared wearing hijab in an adult video. Her stint in adult industry only lasted for three months, and aftermath the hijab-related controversy, she turned a professional took. She utilizes the large following on different social media platforms to discuss food and how to cook. In January 2015, pop band Timeflies released a song titled “Mia Khalifa” in homage to her. In January 2017, xH*mster reported that Khalifa was the most searched-for adult actress of 2016. Khalifa and Gilbert Arenas hosted a daily sports show on Complex News’s YouTube channel from October 2017 to February 2018. Khalifa is a fan of Florida State Seminoles football and attempted to recruit Ohio State quarterback Braxton Miller to transfer to Florida State through social networking. She has a tattoo of the opening line of the Lebanese National Anthem, and another of the Lebanese Forces Cross. Her family disassociated themselves from her because of her career choice. Mia has 2 pet dogs, Toulouse and Amelie.